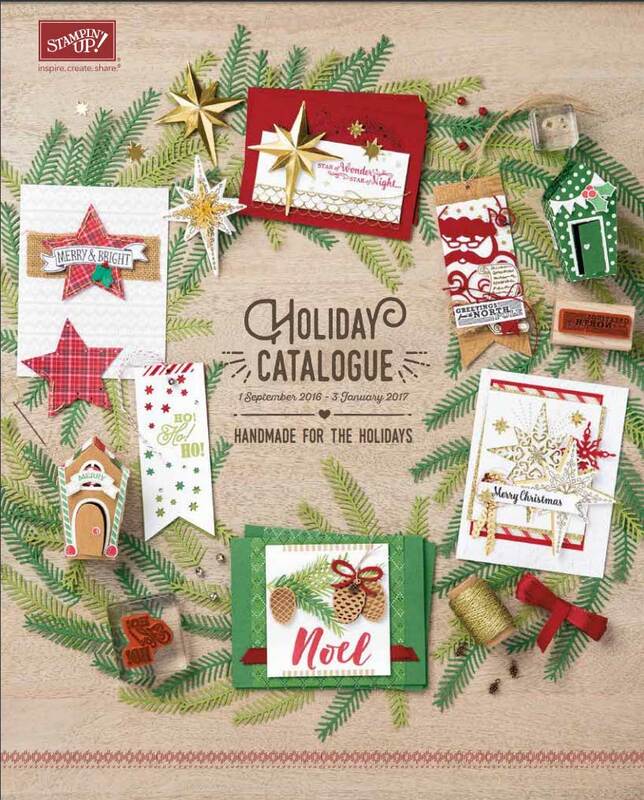 What a fabulous way to wind up 2015 … a collection of cards for you to get a good start on your Christmas cards. Christmas Cuties: These cards were made using Notecards – embellishments need to be kept to a minimum as they are a firm fit in the envelopes provided. 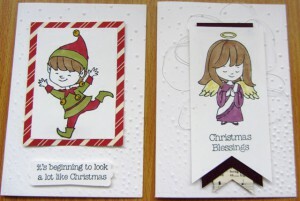 The angel was stamped and coloured with stapmpin write markers – Shimmer white cardstock is better to use for colouring than whisper White cardstock, better still you can use watercolour paper. The Elf was stamped on to Shimmer White cardstock and coloured using stampin! Write markers Home for Christmas DSP (the red stripe ) and the sentiment was stamped in Memento Black Ink punched out with the Modern Label punch. 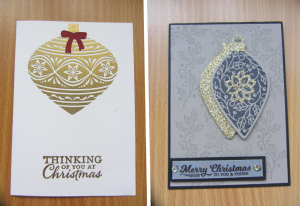 Using the stamp set from this bundle – the ornament was stamped onto the White notecard in Versamark and gold embossing pwder was then heated to create this lovely gold ornament. This is a very simple but elegant card keeping the embellishments to a minimum the sentiment was gold heat embossed and the ribbon was from the Balloons Thinlits set . 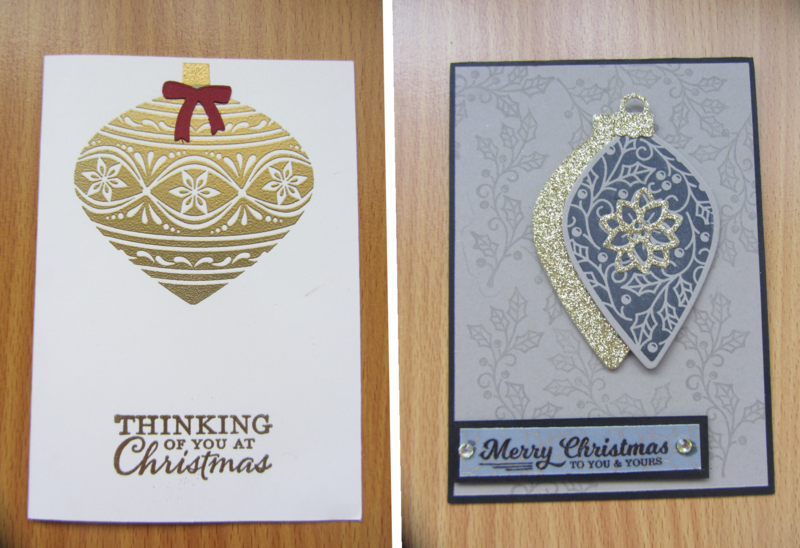 Merry Christmas card was created using the stamp set and (Delicate Ornament Thinlits Dies) One ornament was cut out in Gold Glimmer Paper while the other was stamped in Black Memento Ink on Tip Top Taupe Cardstock and cut out using the same Thinlit Die. The base of the card was half a sheet of A4 Black cardstock. The sentiment was stamped onto a piece of Winter Wonderland Designer Vellum Stack in Stazon Ink and was adhered to a Basic Black cardstock. This card was finished off with 2 Rhinestones . 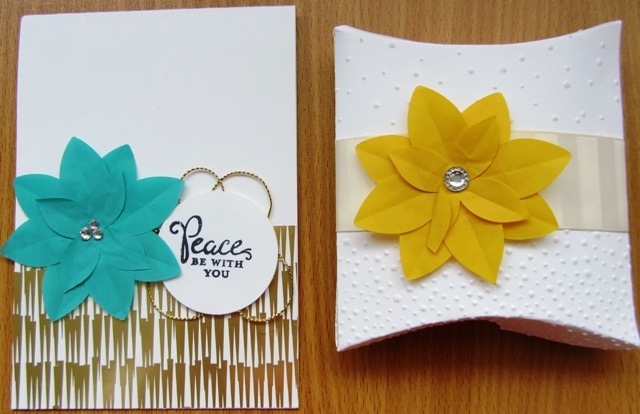 These two cards were made using the Notecards – this is a very economical way to create many cards (especially at Christmas time) You get 20 notecards and envelopes for $12.75: They come in Packs of white and Crumb Cake. 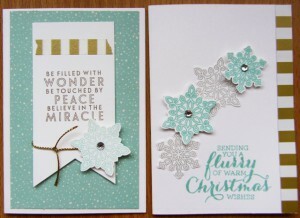 This stamp set comes as a bundle with the Snow Flurry Punch. This is a cool punch and stamp set cause the stamps are in a pair and they punch out perfectly using the punch which cuts them both out at the same time. These cards are pretty self explanatory… the one n the left has a mat of Home for Christmas DSP. The sentiment was stamped on a piece of Whisper White and punched at one end with the fabulous Triple Banner Punch. A strip of Washi Tape was placed at the top of the banner and a snowflake place in the corner of the banner with a dimensional and a rhinestone was applied to the centre. 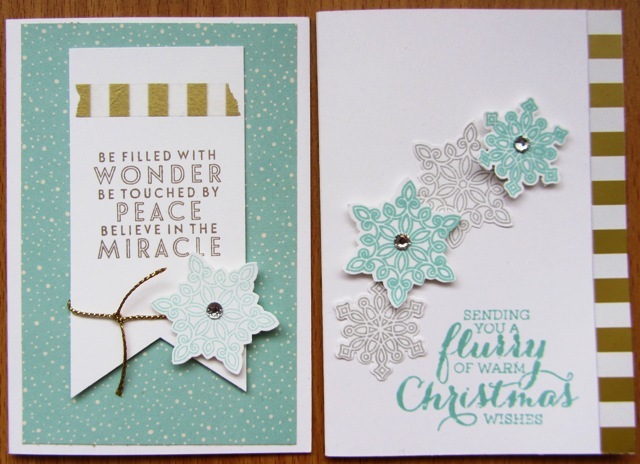 The card on the right had a strip of Gold stripe from the Winter Wonderland Specialty Designer Series Paper – the snowflakes were stamped directly to the card in Smokey Slate and the snowflake stamped in Pool Party and punched with Snow Flurry Punch are adhered with a dimensional and also has a Rhinestone placed in the centre. The Sentiment was stamped direct to card in Pool Party. 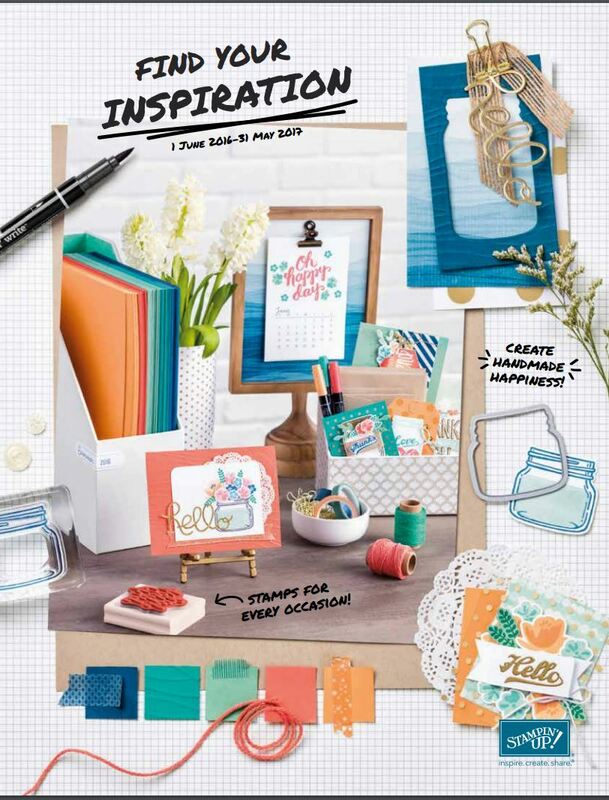 The card was made using Whisper White A4 Thick Cardstock – A mat of Winter Wonderland Specialty Designer Series Paper was adhered to the bottom of the card. The Flower was punched out using the Festive Flower Punch (This needs to be cut in layers of 4 as it will not punch well as one layer) I used 8 medium and 4 small petals Fold each petal in half and adhere to a 1.5″ circle Place the circle on the card front with a dimensional and place a rhinestone in the centre of the flower. Punch the sentiment out using circle punch and wrap gold thread around at the back. adhere this to the card front placing it so the flower sits on top of part of the sentiment . Cards were made using Whisper White Notecards – and Home for Christmas Designer Series Paper. Deer Card: The deer was cut from the sheet of Home for Christmas Designer Paper – Base of card was embossed with Softly Falling embossing folder – Cherry Cobbler Ribbon was cut as a banner as was the Music notes (also from the Designer Paper) The Peace Sentiment was cut out from the Christmas Greetings Thinlits Dies. The deer was adhered with a dimensional to the card. Santa Card: This was done in a similar way but with a strip of Pool party DSP from the Home for Christmas Pack. 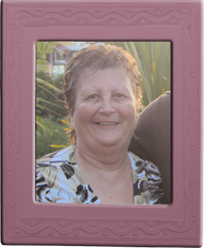 The sentiment was from the same thinlit set and the base was embossed again using the Softly Falling Embossing folder. The Santa was cut from the DSP pack. You can get about 30 santas from one sheet of paper. Wishing you and your family and friends a very Merry Christmas and a Happy New Year – Thank you to all my loyal customers for a wonderful 2015 year.